NOFA MEMBERS: Click here for information about this year's events! Join us for the National Orchestra for All Season Finale concert! Join us for the finale of the National Orchestra for All’s 2018-19 season ‘WordPlay’, exploring how music can be inspired or influenced by both written word and the spoken word. Find out more and book your ticket here! 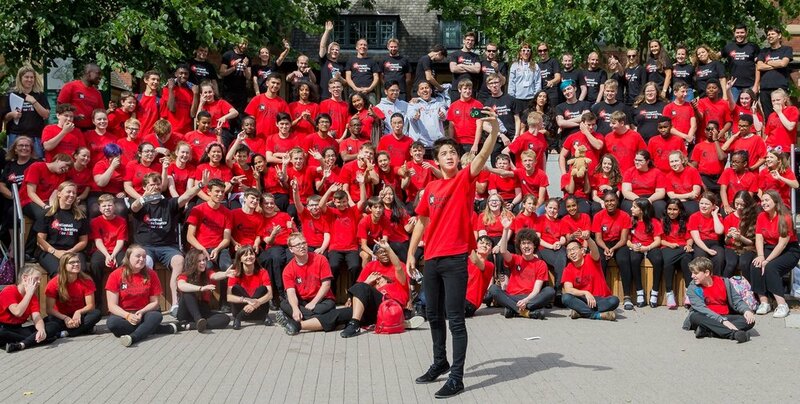 NOFA is a unique, mixed ability orchestra made up of 100 musicians aged 11-18 from across all four countries of the UK. NOFA is the only non-auditioned national orchestra in the world. Young musicians are nominated by teachers, community music leaders, social workers and charity partners for showing dedication and commitment to music in the face of challenging circumstances. Regardless of their background, we set high artistic standards for the orchestra and programme a season of innovative and exciting repertoire in partnership with leading artistic organisations from a range of genres, including the BBC Philharmonic, Royal Academy of Music, National Youth Jazz Collective and One Dance UK. NOFA has driven me in a direction I thought I’d never explore, inspiring me to pursue orchestral performance and a degree in music. NOFA is both an arts organisation and a social change organisation. Our aim is to support dedicated young musicians who face some kind of barrier to participating in music. ﻿Nominated musicians must fulfil Criteria 1 and Criteria 2 and at least one statement from Criteria 3 for NOFA membership as detailed below. It is very important to NOFA that we are able to reach young people who will benefit most from the opportunities that membership in the orchestra offers. Please bear this in mind when nominating musicians. NB: This list of criteria is not exhaustive: should the young person you wish to nominate face another challenge that acts as a barrier to accessing music-making opportunities, contact us! We accept nominations for players of any instrument (including non-traditional orchestral instruments such as guitars, pianos, recorders or saxophones). All of our music is specially arranged for players from pre-grade 1 to 8 standard, and students do not need to be strong readers of music to join. In general we only take a maximum of five players from each school or organisation to ensure we have a broad intake from across the UK. If you have more than five players, contact us about how you might set up an accessible ensemble in your school or community through our Modulo Programme. Returning members: We believe that we will have the greatest impact on a member’s life if we work with that member over a number of years. Any returning members will need to apply as normal but will usually be prioritised if they have proven their commitment over the previous season. All the data we collect will be handled confidentially in accordance with our Data Protection Policy and will be used to make sure that NOFA is reaching the most suitable students, as well as ensuring future funding for the organisation. The NOFA season begins each summer and lasts for nine months. Across the season, members must participate in three residential courses. All travel, accommodation and subsistence is covered, and young people are supported at all events by our experienced team of professional musicians and pastoral staff. There will also be the opportunity to take part in other workshops, side-by-side events with professional orchestras and opportunities to attend concert performances throughout the year. For those members in Year 11 and 12 we offer further opportunities through our Young Leaders Programme, which include the possibility of gaining an Arts Award qualification during the programme. Our current season, Wordplay, has seen the young musicians explore the relationship between music and language through a series of new commissions, arrangements created especially for NOFA and creative composition workshops leading to a brand new youth-created piece. The 2019-2020 season, My Roots, Our Routes, will explore the music that underpins human migrations and journeys, alongside the music that defines individual contexts, backgrounds and histories. We will introduce our young musicians to music that has emerged from some of the most well-known and significant migrations in history. As part of this, we are commissioning two new works that will engage the orchestra’s members in their creative processes. How much does NOFA membership cost? The annual NOFA membership costs approximately £1500 per member, which is raised by our small staff team from a range of trusts, foundations, donors and fundraising events. We ask each nominating organisation to make a donation for each NOFA member. Usually this is a contribution of just £250 per place, a sixth of the overall cost of membership, but it can be any affordable amount. In previous years, organisations have raised the money through raffles, coffee mornings and cake sales - and we're happy to help with creative suggestions to cover the cost. Membership will be invoiced in either May or September of the NOFA year. However, we do not want money to act as a barrier for dedicated young musicians to join the orchestra, and appreciate that some organisations may not be able to cover this cost. Please contact us to discuss in more detail if you have concerns about the financial contribution. NOFA is such FUN, so inclusive and genuinely shows what music making is about. I wish NOFA could be everywhere to show children how much fun music is. How do I nominate a young musician? Discuss the financial contribution with the person who controls the budget for these activities within your organisation. If you are unable to donate please contact the NOFA team and we can discuss alternative arrangements. Meet with the nominee and explain what NOFA membership involves. It is important that the young person understands that nomination does not guarantee membership. All nominations will be considered together to ensure we are working with young people from across the UK who will benefit from the opportunity the most. Confirm with the nominee and the parents / carer the commitment required. NOFA members must attend all three events in the season. Complete the nomination form online within the deadline. When does the nomination process take place?